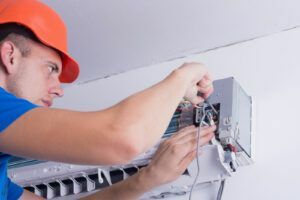 Serving Southeast Florida cities like Boca Raton, Coconut Creek, Delray Beach, and Sunrise, Quality Air Conditioning Company is known throughout Broward and Palm Beach counties for our prompt, expert service. Southeast Florida is known for its sunshine and beautiful weather. But when temperatures reach the mid-nineties as early as March and stay scorching through December, a functional air conditioner is an absolute must. To keep your air conditioner in top operating condition, call upon the company that has faithfully served Southeast Florida customers for nearly fifty years: Quality Air Conditioning Company. Family-owned and staffed by a dedicated team, Quality Air Conditioning Company is the go-to choice for top-notch air conditioner maintenance, service, and repairs. Whether you’re a homeowner in Cooper City, a restaurant franchisee in Fort Lauderdale, a business park administrator in Plantation, a movie theater manager in Hollywood, or a condominium complex landlord in Pompano Beach, you need dependable air conditioner maintenance and service. With years spent out in the field, dealing directly with burnt through and locked up compressors, coolant leaks, capacitor failures, and incorrectly sized ductwork, the well-trained preventative maintenance team and service technicians at Quality Air Conditioning Company can quickly diagnose any issues with your air conditioner. We’ll perform thorough maintenance checks, helping you to avoid any air conditioner malfunctions or failures. To keep your air conditioning system in peak operating condition at all times, consider one of our package maintenance agreements or service contracts. We clearly spell out all covered services, parts, and labor, so you can find the most comprehensive and economical plan to suit your needs. If your system is already failing, you can call upon the experienced technicians at Quality Air Conditioning Company to swiftly pinpoint the problem and repair your air conditioner. We provide same-day service and ‘round-the-clock emergency repairs, so you won’t be left to face a 100° heat wave. No matter the age or brand of your air conditioner, you can count on the qualified technicians at Quality Air Conditioning for rapid and thorough repairs. Our factory-trained team is ready at a moment’s notice to respond to your need for air conditioner repairs. We have a fleet of trucks stocked with more than 800 parts apiece, and air conditioner specialists with the know-how and experience to speedily identify and correct any problems with your air conditioner. With three phone numbers for your convenience, you can easily get in touch with one of our friendly dispatchers, who will send a repair crew to your home or place of business right away. Call us locally at 954-971-1000 or 954-830-7828, or toll-free at 800-649-5415, for the highest quality air conditioner repairs or maintenance.